2012 has been another stonking year in the hills and mountains for Backpackingbongos. There has been a lot of talk about how wet the weather has been. Thankfully up until late December I did not suffer too badly with the weather and its only in the last few weeks that plans have been spoilt. Maybe it’s just my memory erasing the bad bits but I have somehow managed to come back from a few trips with photos of blue sky. In all I spent 66 days on the hills this year, 49 of these backpacking on 18 separate trips. One of the positives from working four days a week is more hill time. I can’t afford the kit I used to buy but hill time is more precious than technical fabrics. It also helps that I have an understanding partner who is happy for me to disappear at short notice. Anyway I thought that I would end 2012 with a brief diary of this years trips. I have basically taken one photo from each mountain jolly and put them in monthly order. Not always the best photos but the ones for me that give a flavour of that outing. 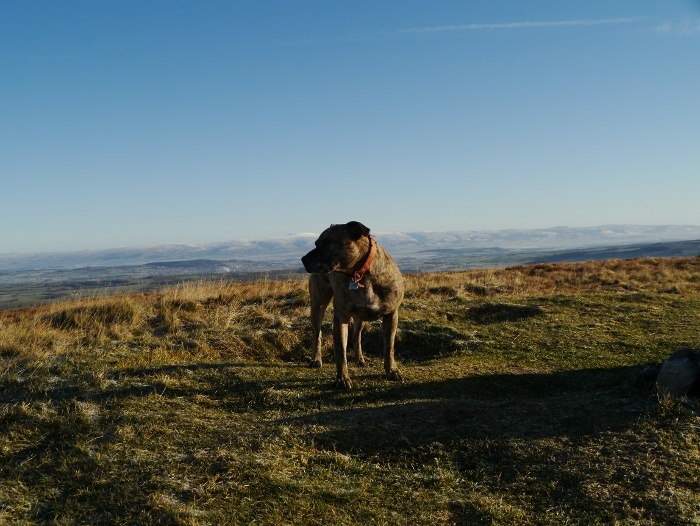 The first day of the year saw me waking up with Reuben and friends high on a moor in the Peak District. The walk in the night before had been in driving rain in the dark, I was dead chuffed to locate that small patch of grass amongst the peat and bogs! 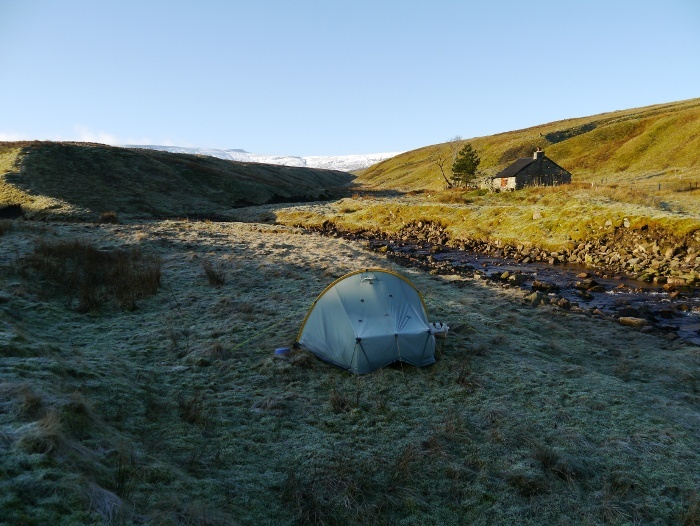 The following weekend was spent with Reuben in a lovely little bothy in the North Pennines. A great night in front of the fire, civilisation miles away. The White Peak is easily overlooked, especially considering it is only an hour away. 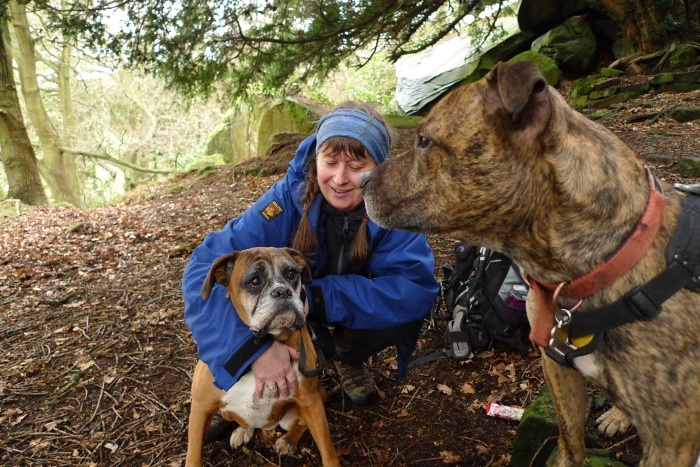 A sociable day with Chrissie, Reuben and Dixie. 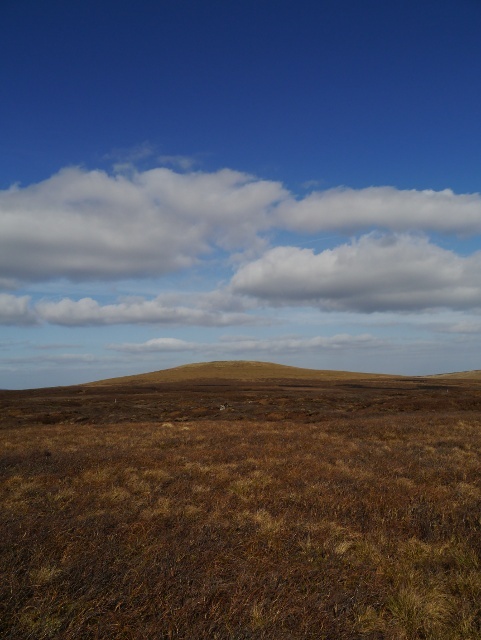 Blue skies and frozen bogs gave perfect conditions in which to explore Bleaklow. It was a fun day especially as it was my first outing with a new camera. 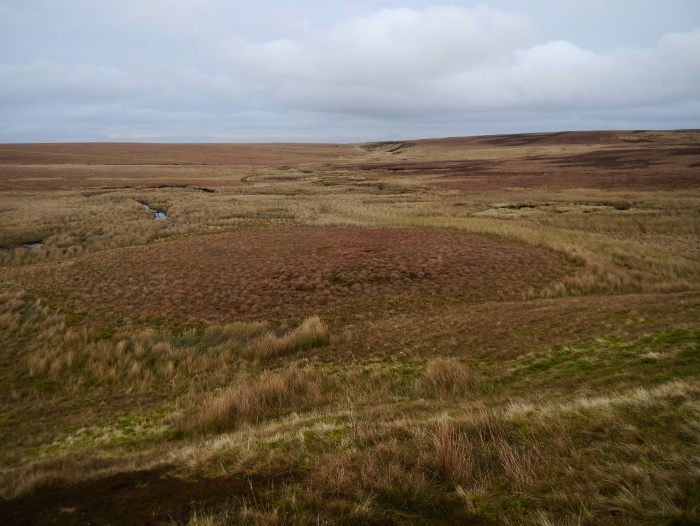 I love the wide open spaces of the Mid Wales moors. 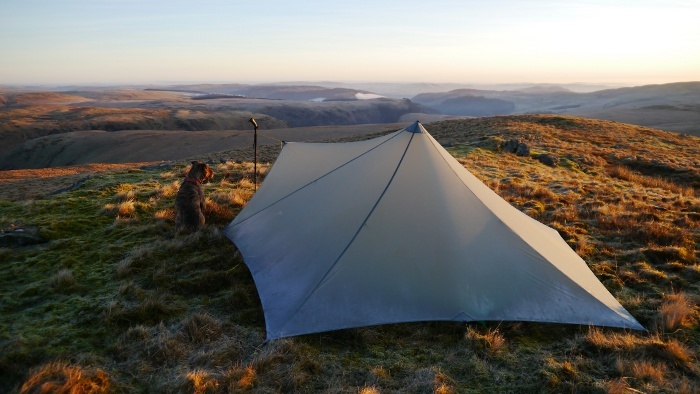 A wild camp near the summit of Drygarn Fawr gave a superb winter sunrise. 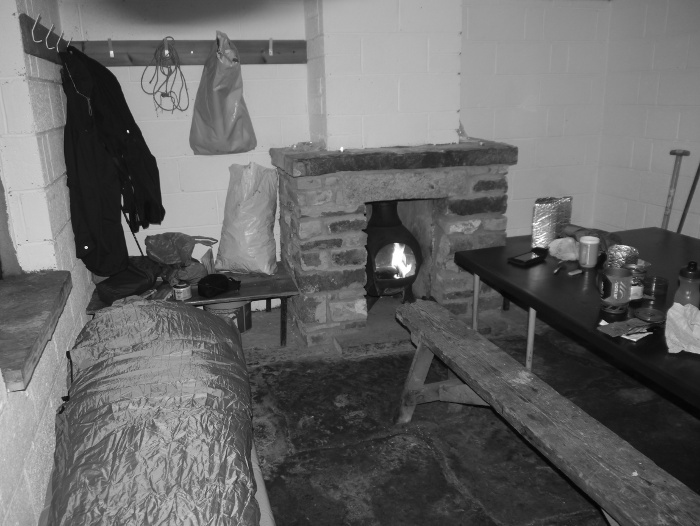 I was soon back in a bothy, this time in Wales. Another night spent staring into an open fire, just Reuben and my thoughts for company. There is a bit of a bothy theme early in the year. 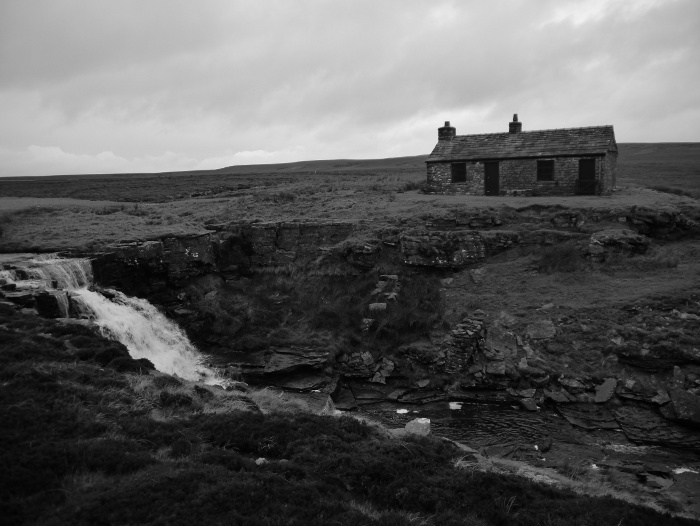 I returned to the North Pennines for a backpack with Martin Rye and his friend. 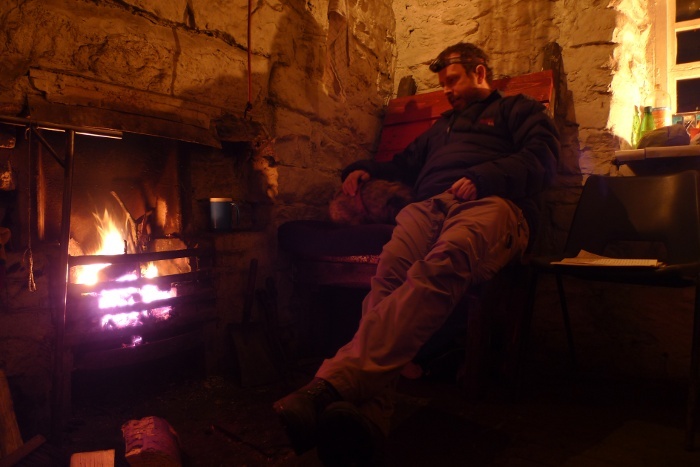 A sociable bothy night this time round, enjoying the fuel we had split between us. 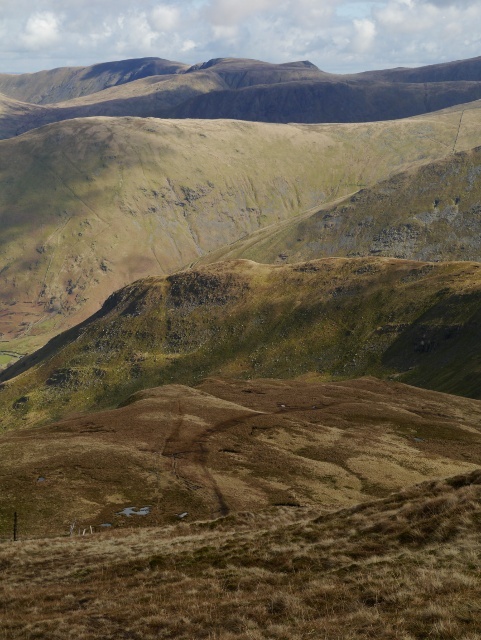 I often neglect the Lake district, preferring the hills with fewer people. However a trip in the campervan reminded me just how special they are. 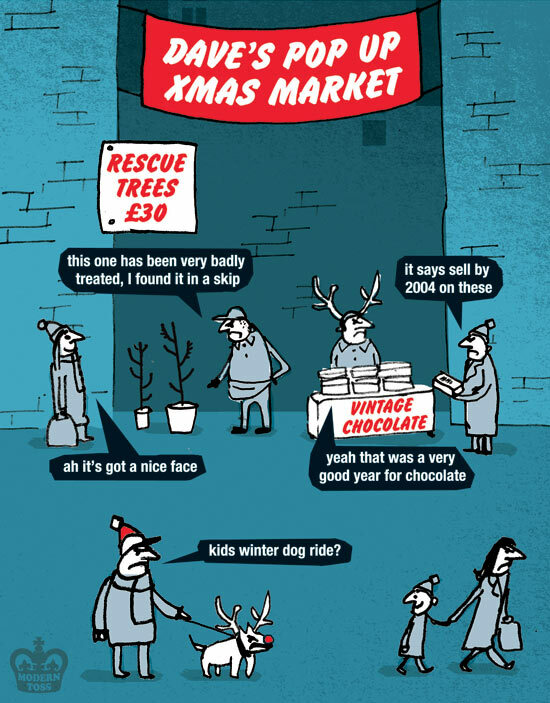 They also give a good opportunity to tick off a few peaks! I was back in the hills with Martin for the second time in a month for a backpack. 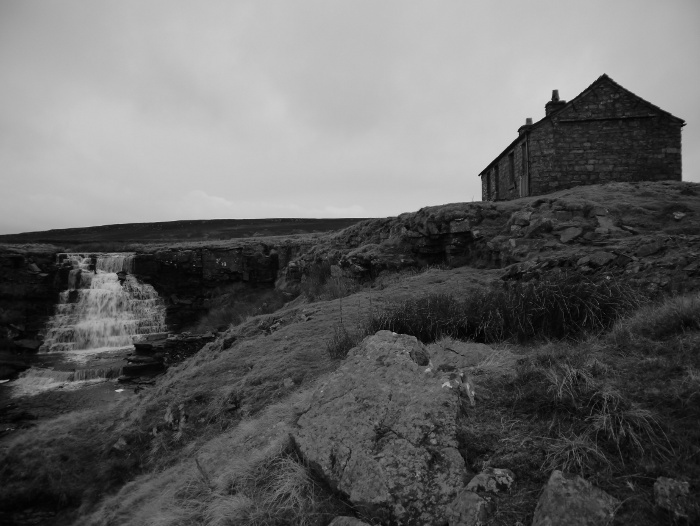 This time it was a visit to a little know and remote peak in the Yorkshire Dales. Although late March, winter made a comeback with sub-zero temperatures at night. I turned forty this year and as a special treat we booked a very remote cottage in the Highlands. 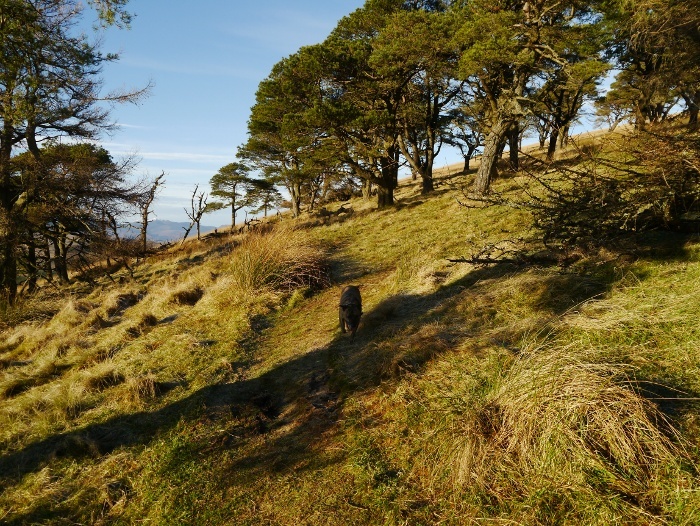 It was fantastic being able to get up every day to walk the hills and mountains and then return to a fire and a comfy bed. I could get used to the luxury! 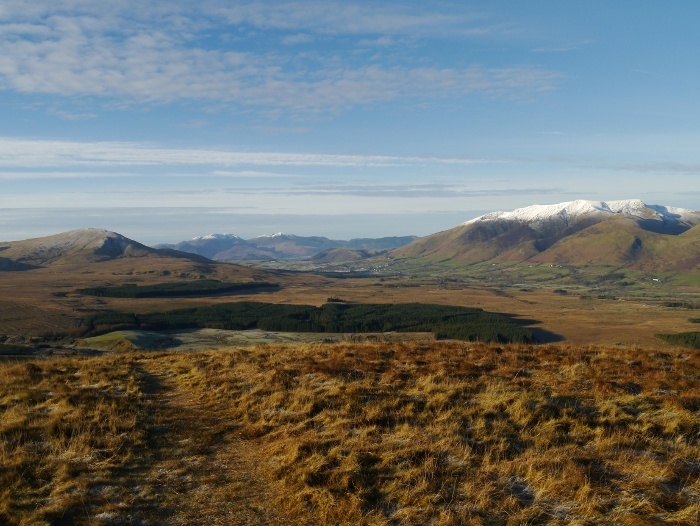 Pumlumon is one of my favourite Welsh peaks. 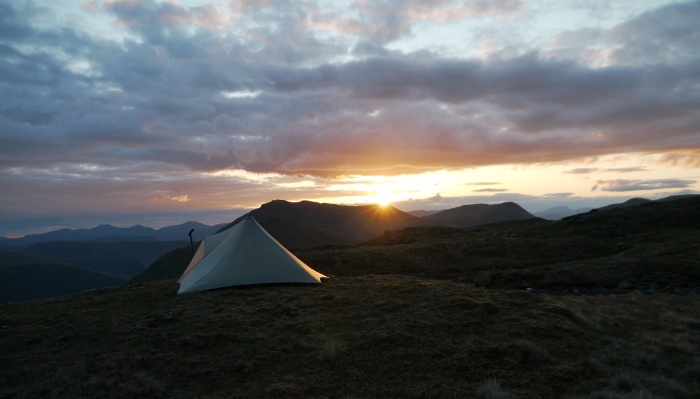 A wild camp near its summit gave a perfect sunset, a lovely warm evening lounging around my shelter with Reuben. With the long summer days I headed to the Peak District after work one Thursday. It was absolutely scorchio that evening and the following day. With an extra days bank holiday I headed to the Southern Highlands for a bagging backpack. 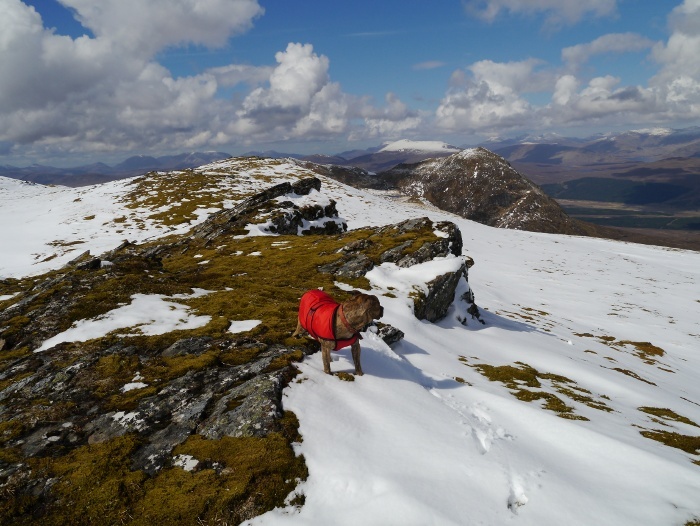 The weather was fantastic and I managed five Munro’s and two Corbetts. Each night I pitched high on the mountains. Not often do I get the opportunity for those sort of pitches in the Highlands. 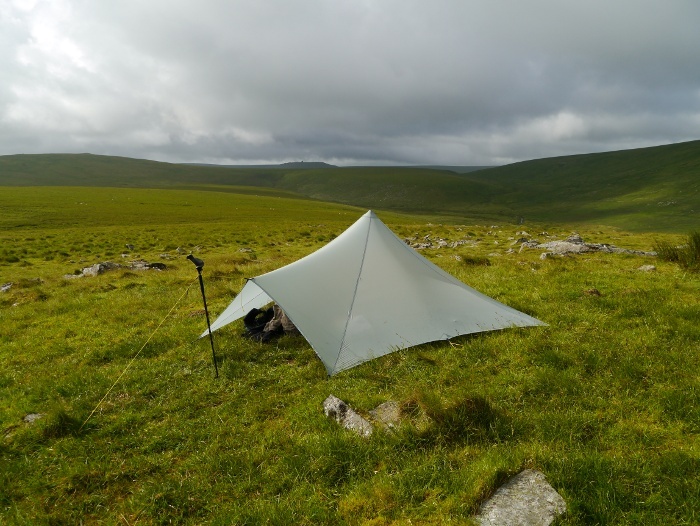 Later in the month and I was chased by wind and rain across Dartmoor. The weather made the place feel even wilder. Reuben made it clear that he does not like walking in the rain. 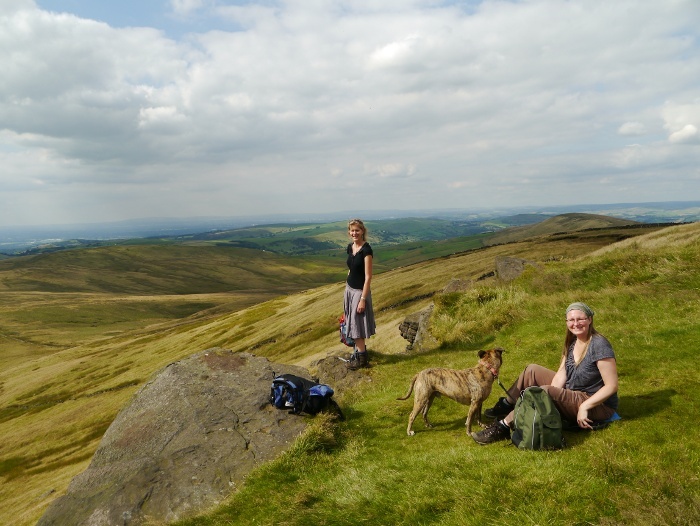 A backpack with Chrissie to my favourite pitch in the Peak District. Martin Rye was in the area doing a bigger walk and we met up in the evening. 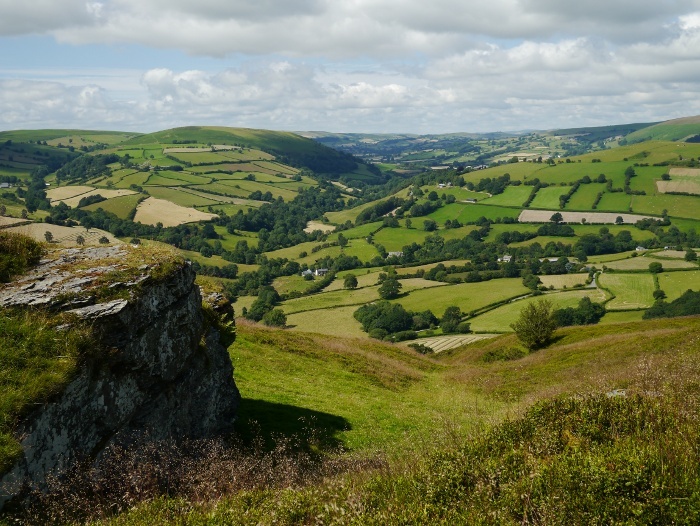 Just to the North of the Brecon Beacons is a lovely area of rolling hills, thankfully neglected by the masses. A great weekend in the campervan until an angry gamekeeper spoilt the weekend by telling me to ‘Get off my hill’. 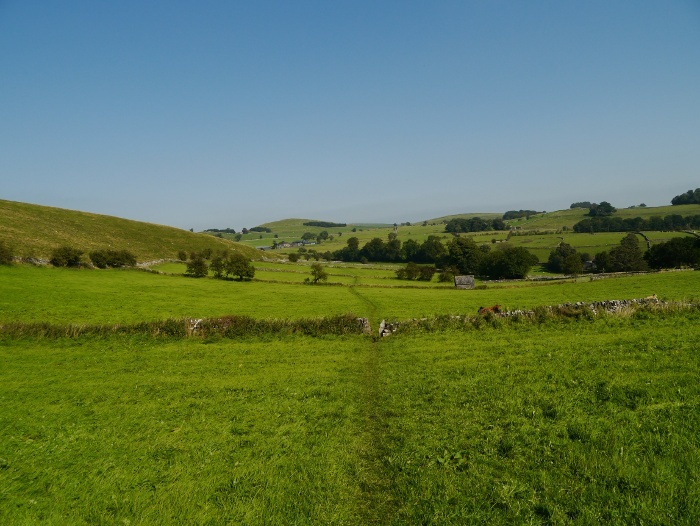 A lovely sunny summers day and Corrina agrees to a walk in the Peak District. We bumped into a friend on the hill who we had not seen for a few years, great to catch up with her. My most memorable trip this year was an eight day solo backpack in Swedish Lapland. Some of the most spectacular scenery I have ever seen. It was also an experience being several days walk from the nearest road. 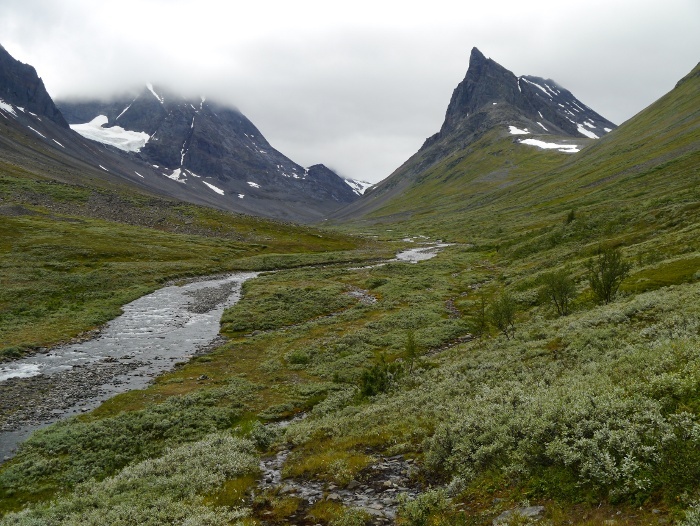 I plan to return soon, perhaps for a trek through Sarek. A walk in the White Peak with Chrissie, Reuben and Dixie again. This time the weather was superb with cloudless skies and warm sunshine. 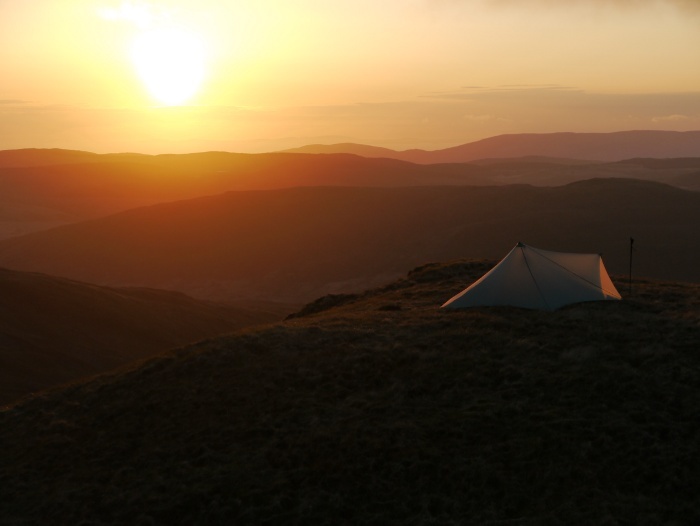 A backpack in the Yorkshire Dales gave a splendid high wild camp with views across the A66 towards the North Pennines. 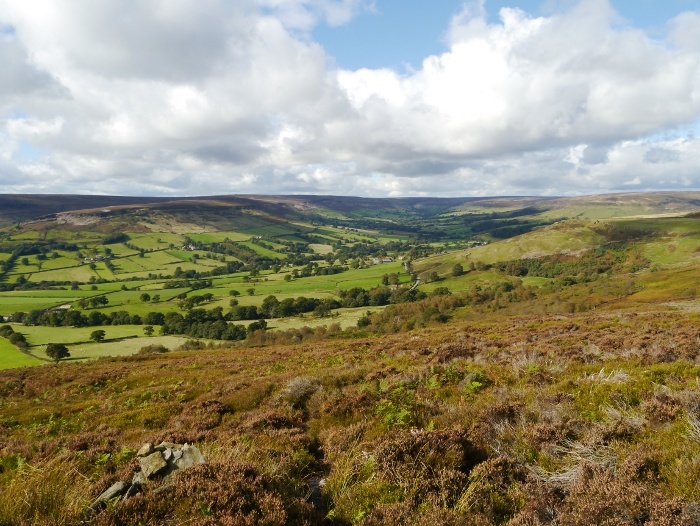 I always forget that the North York moors exist, as usual heading for higher hills further away. A two day backpack showed that they have lots of potential. 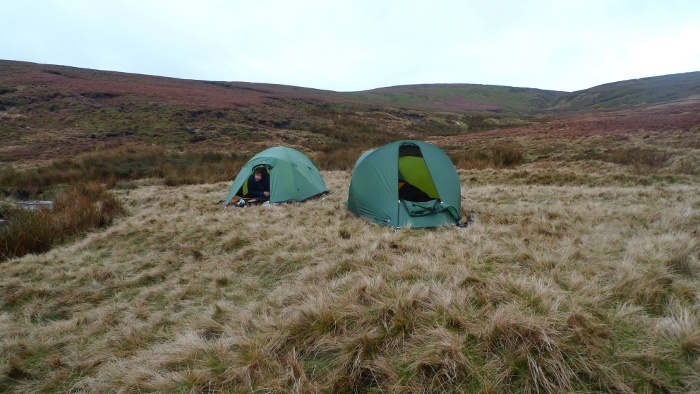 An enjoyable three day backpack with Chrissie in the Yorkshire Dales where we hardly saw another soul. This was the rough often pathless side of this varied National Park. 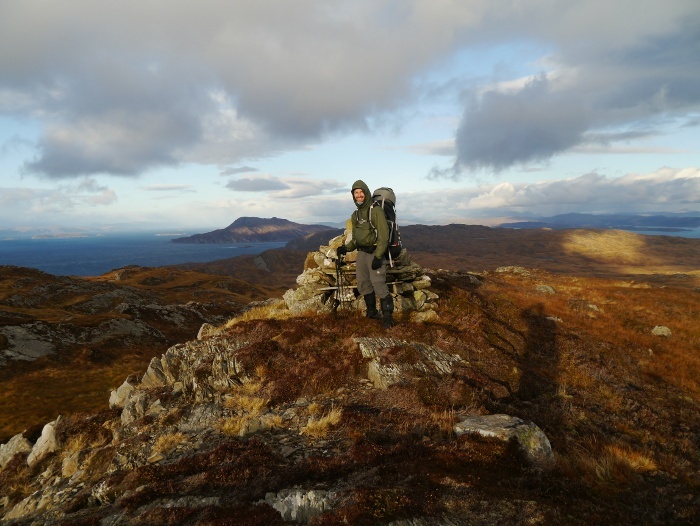 Coming a close second to Sweden was an epic backpack along the West Coast of Jura with my good friend Rich. Some of the wildest scenery the UK has to offer with some rather wild and varied weather. 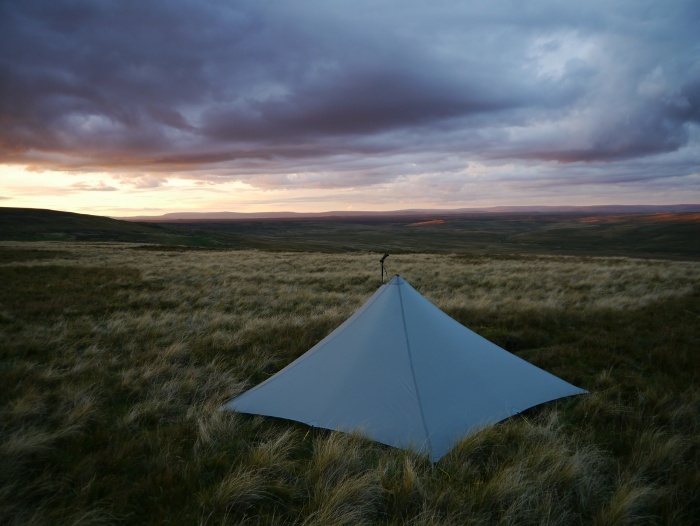 The Yorkshire Dales drew me back for another backpack with a wild camp on the flanks of Fountains fell. After the clocks have gone back the nights are very long! 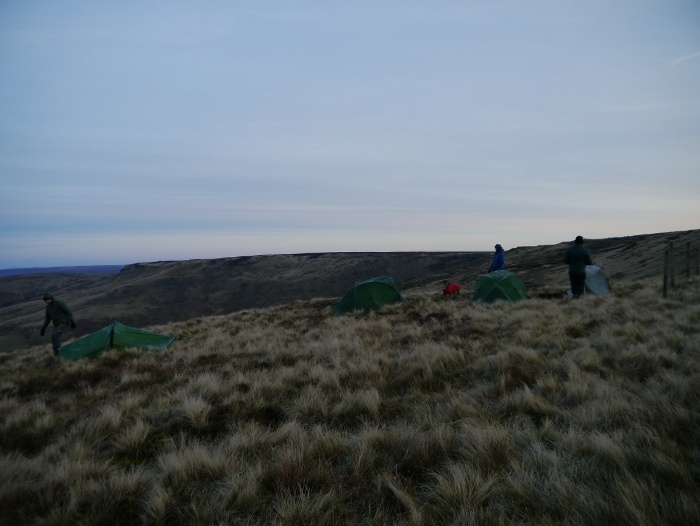 A very sociable night was spent camping on the summit of Kinder Scout with Rich, Chrissie, Yuri and not forgetting Reuben. 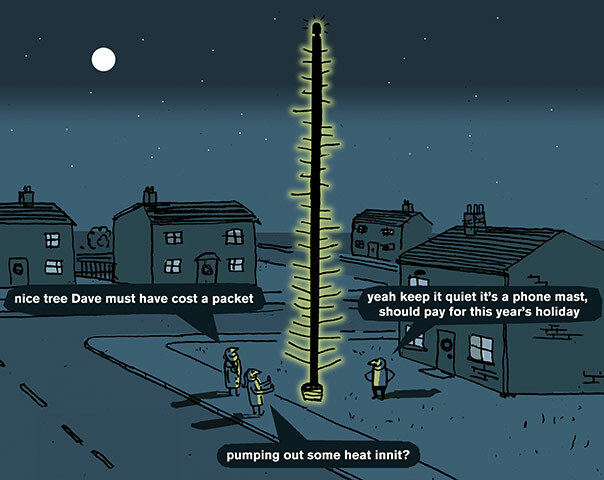 It was dazzling looking down at the lights of Greater Manchester at night. Some of the best conditions this year were on a visit to the Lake District in the campervan. The Newlands Round under clear blue skies and frozen ground was particularly memorable. 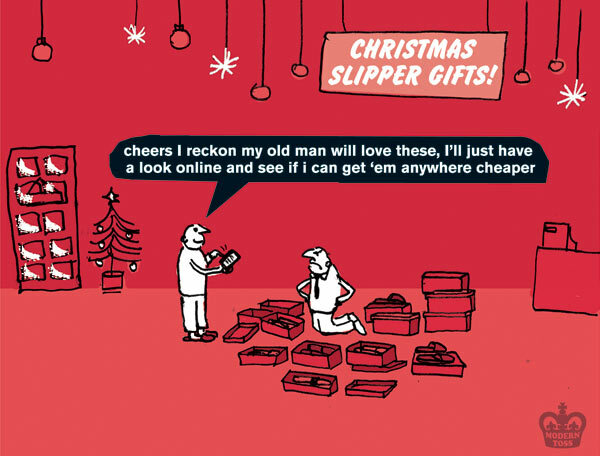 My backpacking year sort of fizzled out and turned into a wet squib on boxing day. 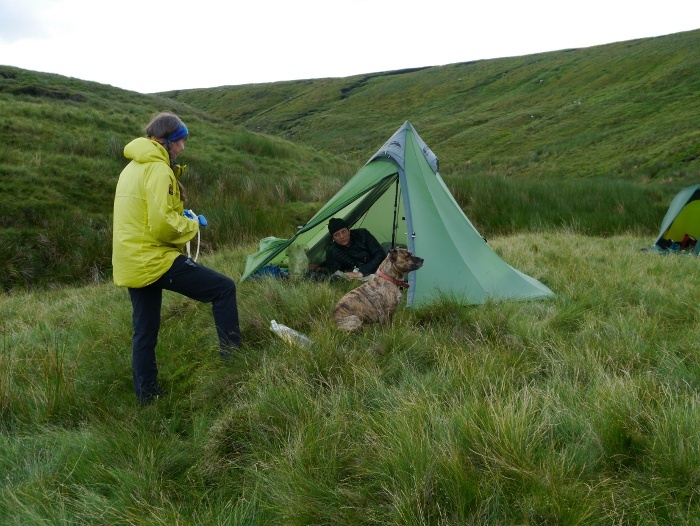 Thankfully I found somewhere to shelter on the moors for the night. 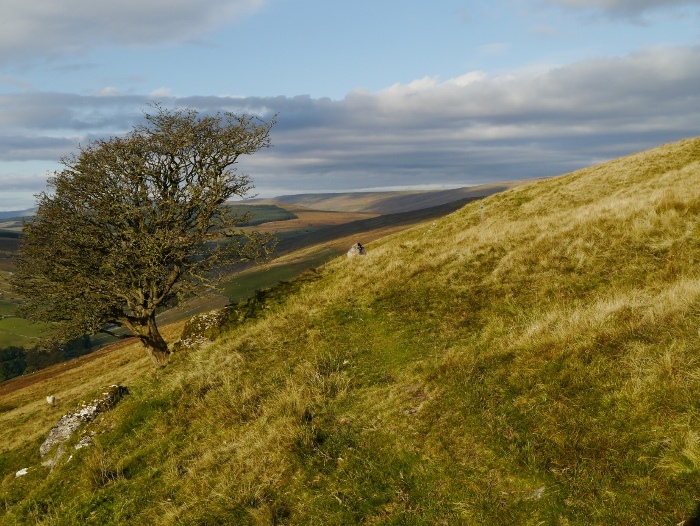 I parked near the summit of the moorland road, the highest part of the two day backpack. For once I was going to start a walk by going downhill. 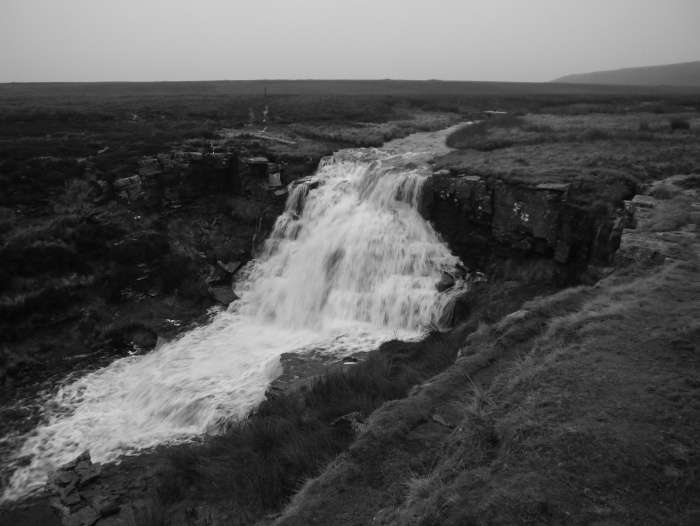 The weather forecast was iffy to say the least but optimism brought me out to the North Pennines anyway. It looked like I was going to be disappointed. Wind was battering the car, mist drifting across the tops of the surrounding hills. I got my gear out of the boot and was greeted by a fine drizzle. I resorted to putting my boots and waterproofs on in the passenger seat, pulling a few nifty contortions in the confined space. Dressed all in black nylon I set off down the road, a slightly rounded and ageing hill ninja. The footpath sign filled me with optimism as I left the road on a green well-drained path. 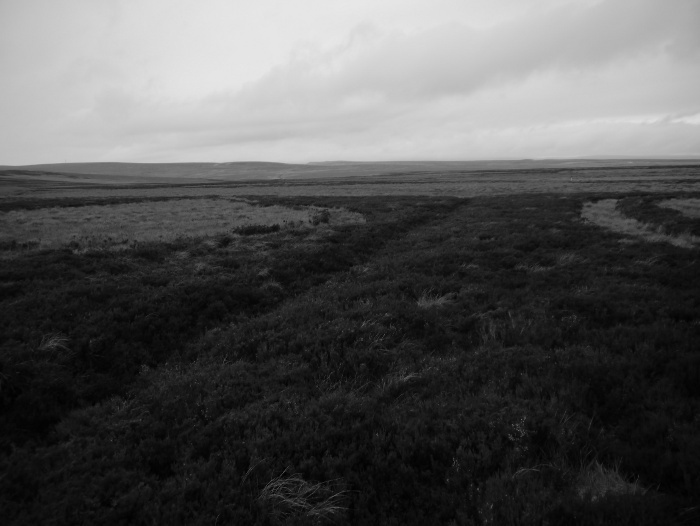 I had read bad things about this path across the barren moors. 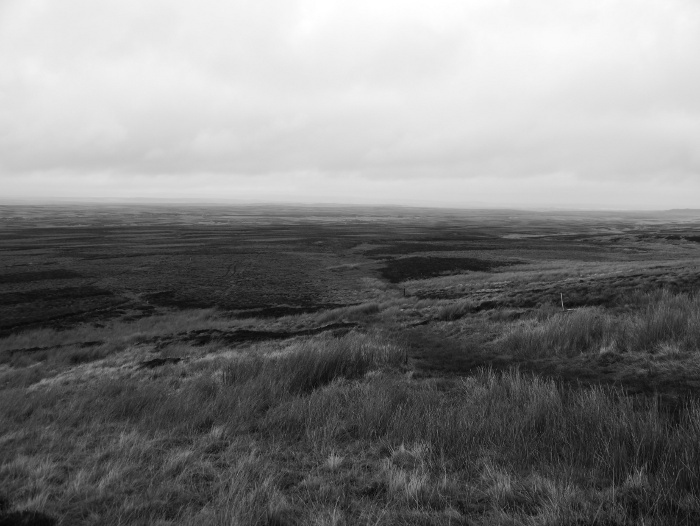 Ahead of me was a sea of flat moorland stretching to the horizon, not a single feature to break the expansive monotony. A land of big skies if the sky itself had not decided to drift just a few metres from the surface of the earth. The waymarked path led me onto that featureless expanse and then without warning deserted me. One minute there was nice springy turf to walk on, the next there was just bog. A final waymarker stood at the edge of the quaking morass and then there was nothing. I squelched along for a few minutes in the direction of the right of way, boots quickly being overtopped by oozing cold bog water. I was soon fed up and decided to abandon the ‘path’, instead I veered off to the left across the heather towards an infant stream. The going was still rough and tough but at least the ground stopped trying to remove my boots. The shallow watercourse gradually became more pronounced before its confluence with a much wider valley. Although shallow its banks were steep sided and I struggled to descend the few metres to the bottom. With all the rain over the past few weeks these banks were as slippery as ice and I was aware that they could have become unstable. 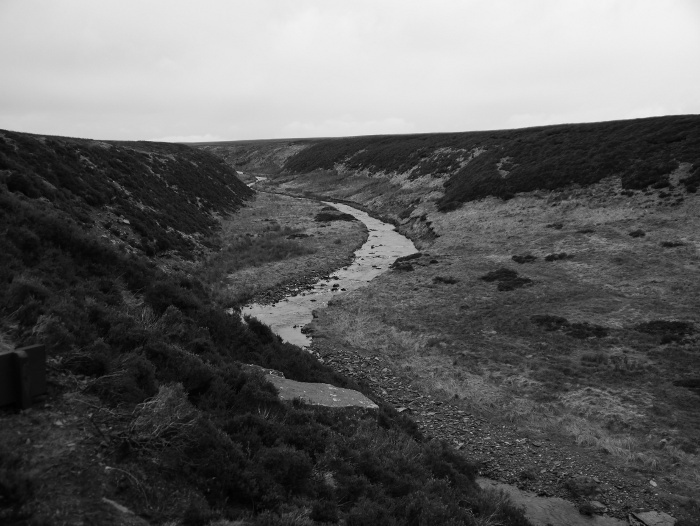 At the bottom the river was uncrossable so I climbed an intersecting valley, the narrow ‘V’ of land giving good views of the river snaking its way across the moor. Below lay what looked like a large garden shed, shiny and new it looked rather incongruous in this wild and bleak setting. Crossing the river by a new bridge I approached it, looking forward to sitting inside to eat my lunch. I was disappointed to find it locked, so instead hunkered down next to it to get some shelter from the cold wind. 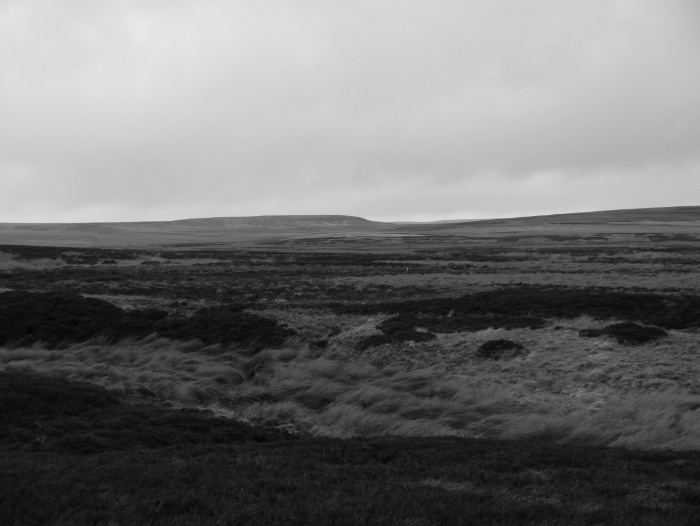 The steep track behind the hut led me back onto the moor, deserting me to face a sea of thick heather. A small watercourse gave a handrail to follow up and over an ill-defined watershed. The gathering ground for another stream was a mass of reeds and sphagnum moss, a watery grave for the unwary. I carefully sloshed my way across, the ground a quaking mass, clumps of rushes providing the only solid foothold. It was like walking across the worlds wettest mattress. I don’t think that the moors can hold much more water. The infant stream led me damply down into a large shallow bowl, a slightly raised bog being its centrepiece. A combination of a fleeting lightening of the sky and the vividness of the bog brightened the scene considerably. A joyfully wild scene if you ignore the distant sound of traffic. 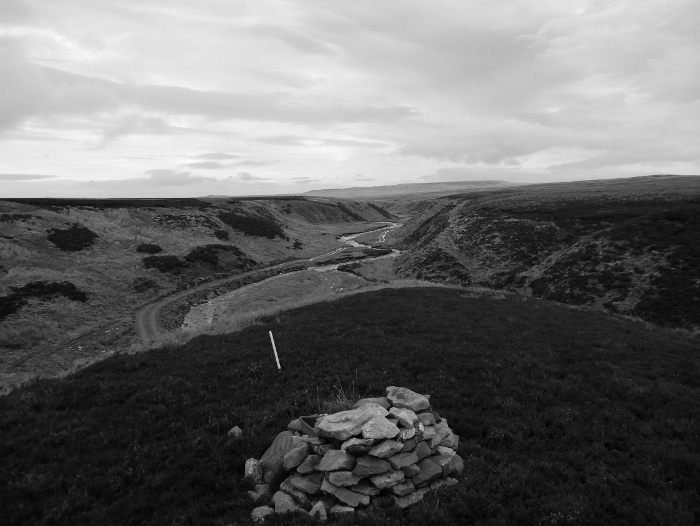 The north Pennines have some wonderful watercourses hidden away on the wild moors. Here the open expanse was broken up by a rocky defile with a splendid waterfall crashing into its depths. The waterfall is reasonably wide and must drop a good twenty feet, yet is not named on the 1:50,000 map. I imagine that few people come here, these moors being well off many people’s radar. However on this wet and windy day the Pièce de résistance was the shooting hut that is wonderfully situated right above the waterfall. The first door that I tried was locked, however the other was not. 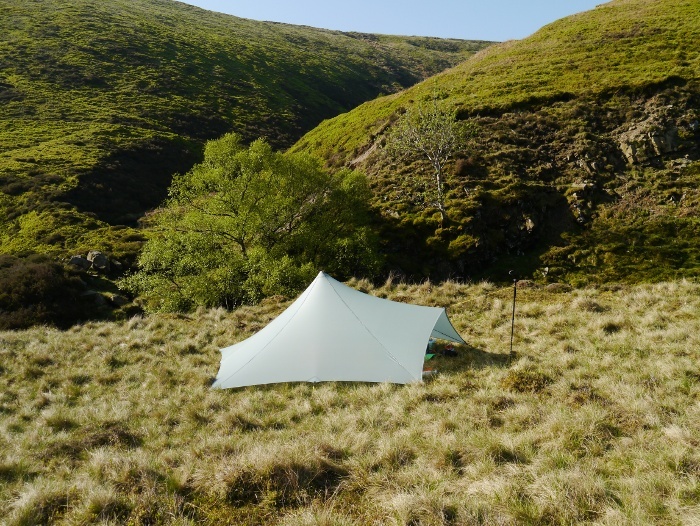 I would now not be spending a long night cooped up in a small backpacking tent during the gales that were predicted for later. 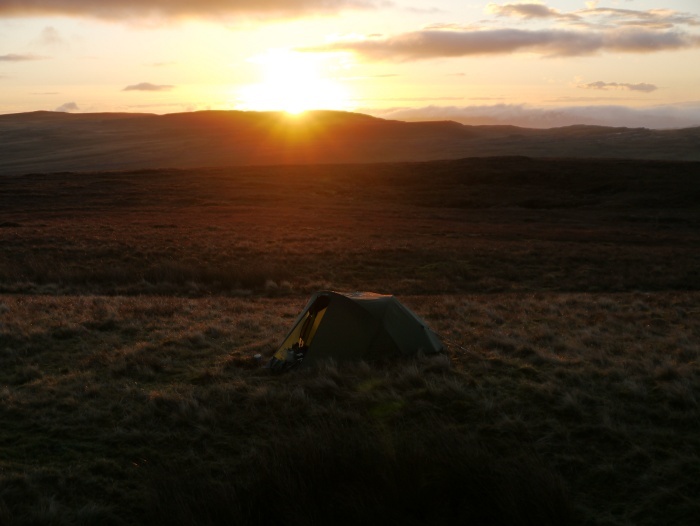 It was only quarter past three and I did think about bagging the hill directly behind the hut. However this would have involved a long trudge across more wet moorland. I really could not be bothered. Instead I mooched about my immediate surroundings, made a coffee and stared intently at the waterfall. 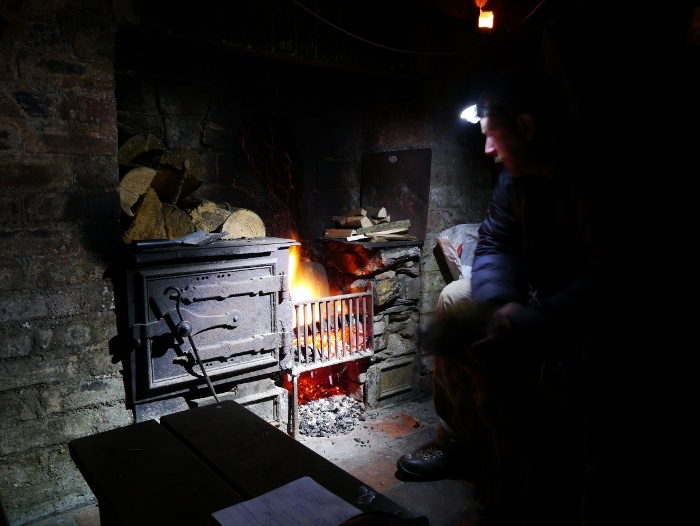 By four it was dark and I sat in the hut stretching out the process of making food and hot drinks. I finally lit the fire log I had carried across the moors and watched it produce no heat for an hour or so. Finally I bedded down on a narrow bench for the night and did my best not to roll off onto the concrete floor. The wind picked up during the night, rattling the door and the roof. The white noise of the waterfall outside intensified, becoming a roar. My alarm went off at seven thirty and I reluctantly got up, it was still pitch black in the hut. With a cup of coffee I went outside into the pre-dawn murk, the waterfall looking rather splendid after the overnight rain. A second coffee and bacon noodles were consumed before I packed up and headed outside. My enthusiasm to be in the hills that I had felt the previous day had vanished. 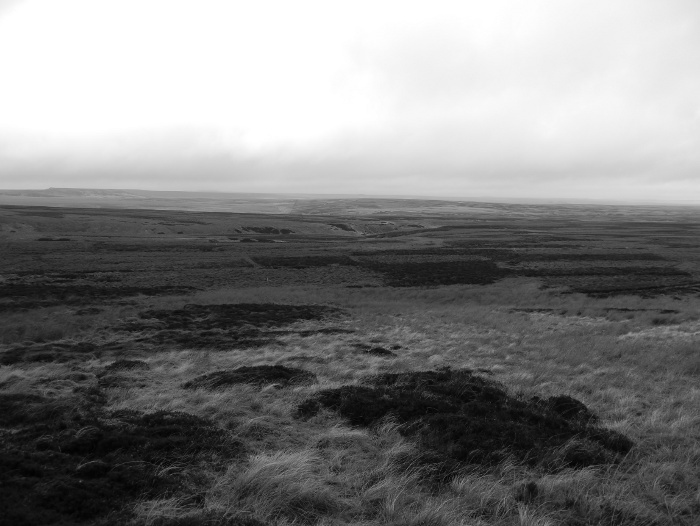 I was faced with the cold wet reality of mist shrouded moorland. Thankfully I had a good track to follow, the estate obviously having spent a lot of money on the local grouse shooting infrastructure. I’m not a big fan of tracks being bulldozed across the moors but this one had been done reasonably well and was beginning to soften into the landscape. However it was still not marked on my map and I followed it rather blindly hoping that it would come out roughly where I wanted. At one point the rain turned sleety and then for a few minutes full on snowy. Not that white fluffy snow though, just the stuff that is as wet as rain only colder. The track deposited me close to the trig point and I managed my bag without too much effort. Somewhere in the gloom there was an unseen shepherd shouting something at what I assume was a dog. I met him on his quad round the corner, he asked if I had seen seven sheep which were missing. On the road I stood at the footpath sign pointing off into the mist, my route being another five miles back to the car. However instead if I continued along the road for a mile and a half I would also be back at the car. I have to admit that I took the easy route. It was pleasant enough if walking into wind-driven sleety rain could be called pleasant, and only two vehicles passed. I was dismayed to see that the verges were liberally sprinkled with the detritus of some underdeveloped half wits that had passed by, knuckles dragging behind their vehicles. I could have filled a couple of bin bags with the confetti of the unthinking thick with beer cans, fag packets and takeaway wrappers. One thing I learnt is that Neanderthal man has undeveloped taste buds as Carling and Fosters are their weak lager piss drink of choice. 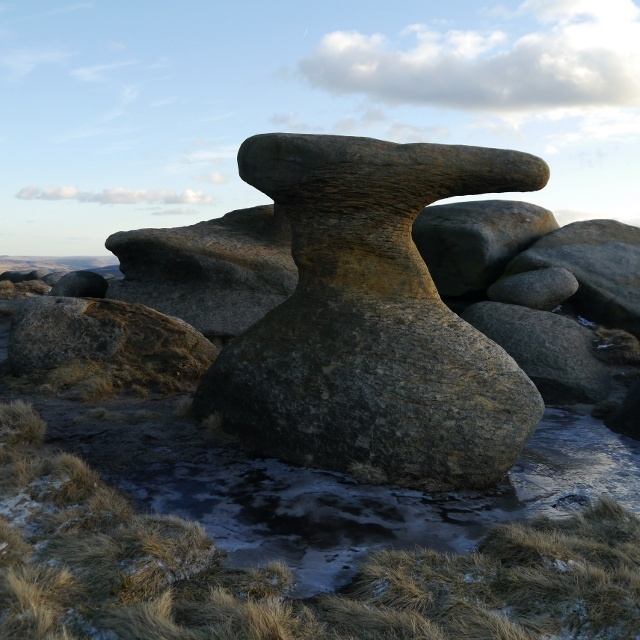 Anyway, lets wax lyrical a bit about the rolling moors rendered as soft outlines rolling off into the horizon. Bright patches of sky quickly chased away by banks of hill fog. I was pleased to get back to the car, surprised at just how clean it now was. High on the moors in the wind and rain makes for a perfect natural car wash.
Sleeping in a metal box is not the best way to keep warm on a sub-zero winter’s night. Metal really is not a great insulating material. Thankfully I had made a nest on the floor consisting of a memory foam mattress topper, a duvet, two sleeping bags and a shivering dog. I woke at first light and pulled up the blinds to see, nothing. The windows were covered in ice both inside and out. The £10 stove that lives in the Bongo was sluggish but it did manage to eventually boil enough water for a cup of coffee. I stood outside in the empty car park with plumes of steam rising from my mug, enjoying the silent morning. It took a bit of coaxing to get Reuben out and then I realised why, he was a broken dog. He resembled a crab as he shuffled over to the verge for a pee, limbs appearing to have been removed and put on backwards in the night. I’m not sure if he was putting it on for my benefit but it was a sorry sight. The day before we had done the Newlands round and the wind must have got to his brain as he spent the day racing around constantly. He was now paying for his canine over indulgence. 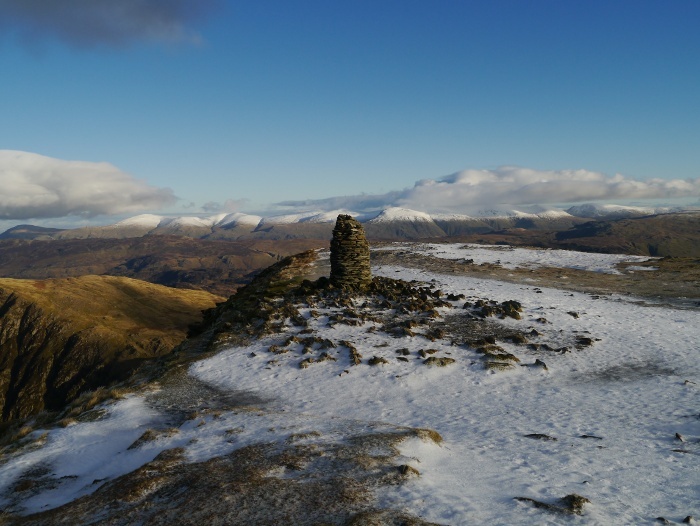 My plan had been to crack out the spikes and climb Helvellyn, but it was evident that he would not be up for it. I decided it best to head on home for his sake, a real shame considering the stunning weather forecast. Over another cup of coffee in the van I could not resist a quick look at my map. The summit of Great Mell Fell always catches my eye on the drive along the A66. Reuben would want a walk at some point during the day. I thought we might as well make it a scenic one. There is room to park a couple of cars next to the track on the south east of the fell. We took to this track for a bit before entering the woods through a gate. I let Reuben off the lead once in the woods where he decided that maybe he was not too stiff for a bit of a run around. We contoured along a narrow trod for a bit before climbing directly up through the trees. Boggy patches were well camouflaged by a thick carpet of fallen leaves. After a while we headed further west and finally picked up the main path to the summit. Breaking out of the woods the view was of snow clad hills rising above the Matterdale Common. 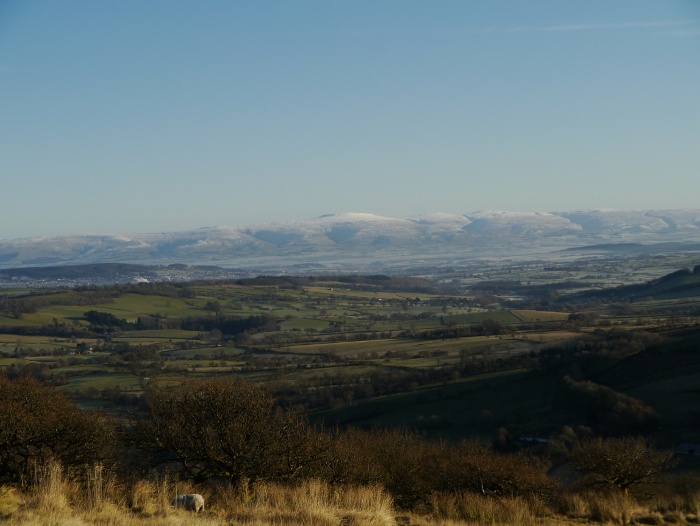 Climbing higher, the North Pennines presented themselves across the Eden Valley, a moorland barrier also topped with the white stuff. Further up the hill the path passed through an area of old pine, weatherbeaten from the westerly winds that must hit this isolated hill. The sun felt warm in the completely still air, there was not even a hint of a breeze. I really could not have asked for more perfect conditions. 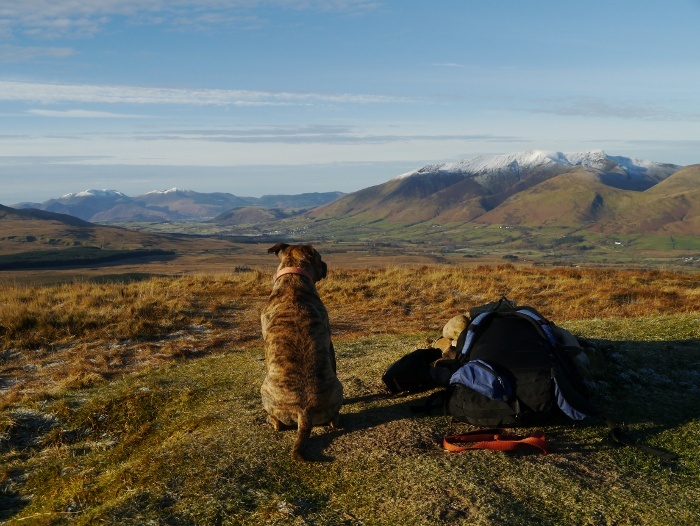 Great Mell fell itself is a bit of a dull pudding, but the views are anything but dull. 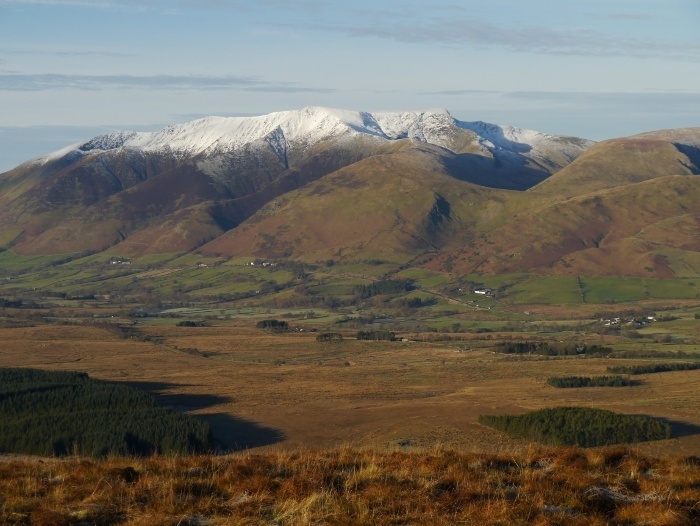 The snow topped Blencathra dominated the view and I found my eyes constantly being drawn to its bulk. Helvellyn would have been stunning but the low light meant that it was just a dazzling flash of light due to the reflecting sun. I spent a good half hour just quietly savouring the conditions and the views. Reuben intently looking out for anything that he could provide with a bit of love. The long drive home was soon calling so I reluctantly set off back down the path, passing three groups on their way up. I had timed the walk perfectly to get the top all to myself for so long. 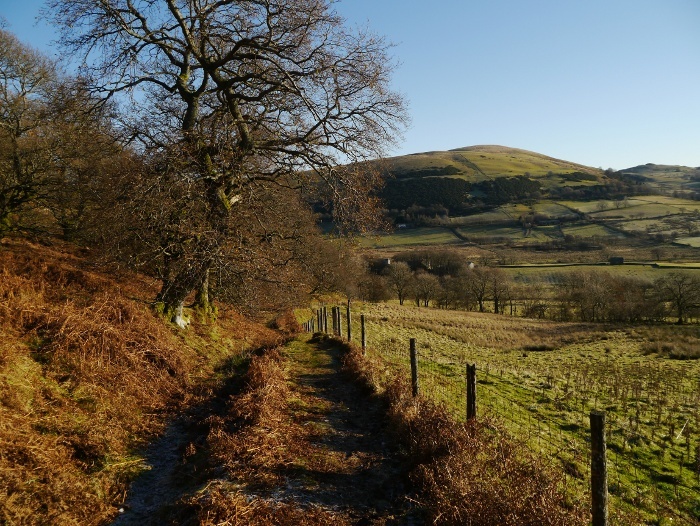 Next time you are whizzing along the A66, pull over for an hour or so and climb Great Mell fell, the views are definitely worth it. Wind Wise Radio have a petition at Change.org titled ‘First Minister Alex Salmond: Stop the reckless siting of wind turbines in Scotland’s scenic landscapes’. Please head on over and have a look and if you agree sign it.